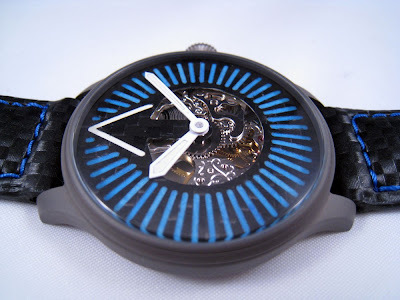 WATCHMATRIX: PyroLume 45mm Titanium Turbofan Skeleton "Blue Themes"
PyroLume 45mm Titanium Turbofan Skeleton "Blue Themes"
"Case: Excellent quality full titanium case, crown and display caseback. This case set is a lightweight and solid foundation which is water resistant to 5atm. Movement: Very rare and exquisitely built Unitas 6498 style skeletonized movement with finely detailed bridges, extensively machined gear wheels and blued screws all visible through the display caseback. This movement has a power reserve of roughly 40 hours and is fitted with a set of lovely white alpha design hands. Dial: Custom Pyro Turbofan V2 dial CNC machined from 0.25mm thick 2x2 twill carbon fiber sheet using 1/32" cuts. 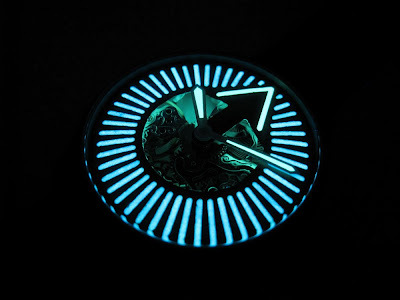 The dial is finished with a matte finished clear coat surface. 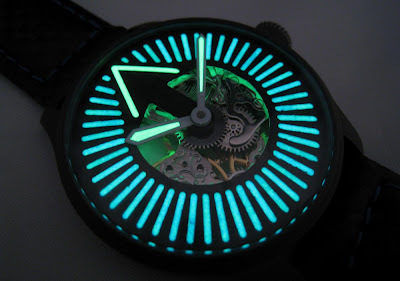 Luminescence: Dial receives a combination of prototype Ultra Blue PyroLume and Super Green v2 PyroLume to the index markers as well as to the hour and minute hands. 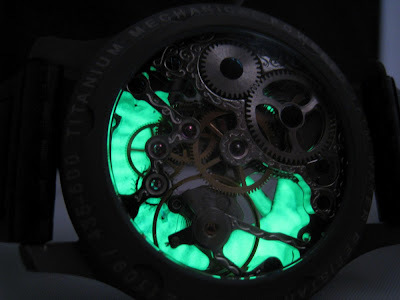 The back of the dial receives multiple layers of Super Green PyroLume for the effect you see in the photos. 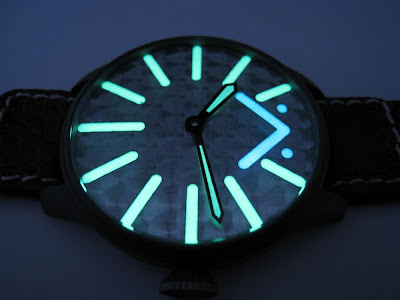 I continue to develop my luminescent formulas on a watch by watch basis and this example represents my latest mixture of Swiss made luminescent pigments, binders and fillers - all optimized for best daylight finish and maximum nighttime luminescence. Strap: Beautiful and comfortable padded carbon fiber grain strap measuring 22mm wide with double keepers, matched blue stitching and stainless buckle. If you wish to have a different strap or bracelet installed please contact me to discuss what I have available on hand. About the watchmaker: I am a board certified Anesthesiologist practicing in New Jersey. 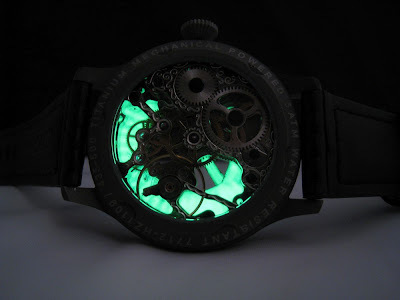 I first began customizing and fabricating watches for my own personal collection. With the encouragement of friends and family I began selling very limited numbers of my watches locally and on the internet. I personally perform all design and fabrication in my home using AutoCAD and a MicroKinetics CNC benchtop mill. 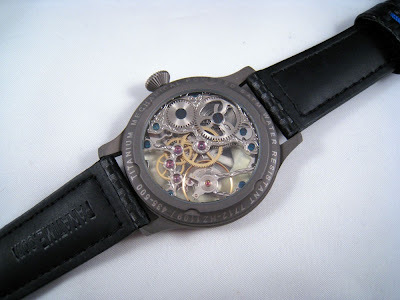 I also assemble and test every watch to ensure that you are receiving a timepiece that you can enjoy for many years. 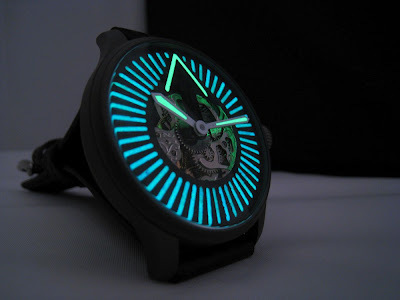 My goal is to create a line of unique watches for true watch aficionados who can appreciate designs that continually push the envelope of traditional watchmaking. I always welcome feedback and ideas, so don't hesitate to click "contact the seller" and let me know what you think of my latest designs." You can see some of the sellers other watches here. Further below is one other design.